Been awhile now, hasn’t it? In my experience, people hold on to “unwanted” pounds for very specific reasons. These reasons are on a subconscious level, which is where things get tricky. This recipe takes protein filled tuna and adds fresh ingredients to turn it into a healthy tuna salad. 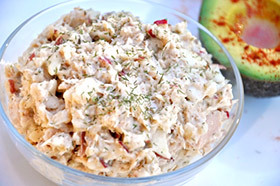 Unlike many tuna salad recipes, this one doesn’t call for dressings or mayonnaise that add undesirable fats. 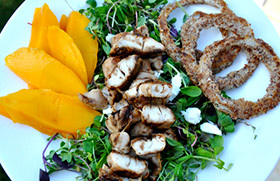 Have this for lunch or dinner, and keep it lean by skipping the bread and eating it straight from a bowl. Drain and flake the tuna in a medium sized bowl. Serve in a bowl, on large lettuce leaves or in half of an avocado, garnish with dried dill weed. Add Resistance. Between sets of cardio do a set with dumbbells, resistance bands or with your body weight. Increase Speed. Really push yourself during the sprinting intervals. Remember, it’s only a handful of seconds. Lengthen Intervals. Add a few seconds to your intense intervals. Change Exercises. If you’ve been sprinting then switch to burpees or high knees. While we know that spinach, kale, pomegranates and tomatoes are all healthy foods and we should be getting as many of these fresh fruits and vegetables as possible, did you realize that there is a color wheel of food that we should try to eat from daily? There are 5 unique colors of foods, and one of the goals of eating healthy should be to get foods from each of these color groups every day. While eating any amount of fruits and vegetables is a healthier than nothing, by stepping it up and eating each of these colors daily, you can greatly increase your overall health. Each color group in food has its own distinct nutrients. So by eating all the colors, you are ensuring that you are feeding your body more nutrients, which all help body functions in varying ways, creating an overall healthier you. Here are the 5 different color groups, the benefits they provide, and where you can find them. Here’s a great recipe for a busy weekday dinner. 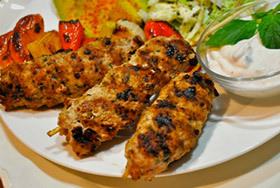 Ground turkey breast is mixed Mediterranean spices to create flavorful, protein-packed kebabs. Serve with salad and vegetables and a side of plain Greek yogurt. In a food processor, blend the turkey strips until ground. Add the remaining ingredients and pulse until well blended.